← Learned helplessness – victimhood and the Siren song. Home » Rambles » Cooking as an empowering act. Cooking as an empowering act. I’ve come to see cooking not as a chore but as a truly artistic and creative act. It is so empowering to feed myself. It is amazing to know that the majority of the prepared foods we have in our refrigerator at home were prepared by me. Hummus. Pesto. Banana bread. My green breakfast drink. Even dessert – all prepared by me. From scratch, and organic as much as possible. How did we as a society get so far away from this? We all used toprepare our own foods. Large grocery stores are a new phenomenon. Sure, there were greengrocers. They had fruits and vegetables. Then there might also be a local baker. Baking bread takes a long time and is hot work. In some villages in Greece it is common for women to prepare their bread but then take it to the baker to get it cooked. They return later to pick it up. But we used to all know where our food came from, and what was in it. We used to all know, because we made it ourselves. In some cases we knew because we grew it ourselves too. In getting away from making our own food, we’ve gotten away from ourselves. We’ve given away a part of ourselves. We are what we eat after all. If we don’t know what we eat, then what are we? There are so many foods with ingredients in them that we can’t even pronounce. They are more chemical than real. One of my favorite examples is this. 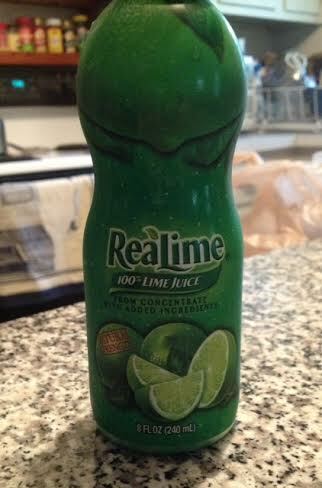 If you have to tell me it is a real lime, then it isn’t. Real limes don’t need labels. 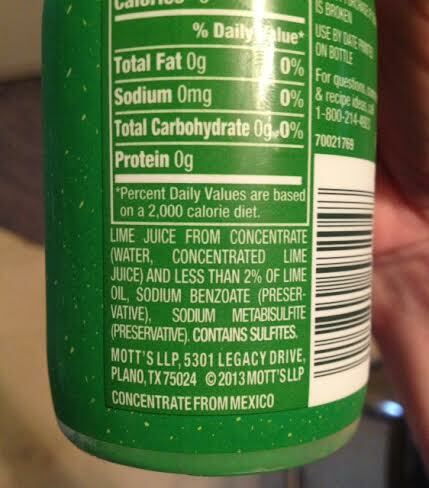 Look at all the preservatives. It isn’t hard to buy a real lime and to take the juice out of it. Of course it has preservatives. This is the only way it will last from the production plant to your house. As Michael Pollan says in his book “Food Rules”, eat plants, not food made in plants. It takes some time, sure. It can be done. I work 40 hours a week, and I had no cooking experience, and I can do it. Take it step by step. Pick one thing you like to eat that is prepared, and learn how to make it. You can get a book from the library, or watch a video on YouTube, or you can ask a friend who knows. Or you can experiment and figure it out on your own. That is fun too. The more you make for yourself, the healthier and happier you will be. This entry was posted in Rambles and tagged cooking, food, from scratch, healing, health, self-care, taking care of yourself. Bookmark the permalink. Lol. So true. You don’t see “Real Lime” on an actual lime in the produce area.